The CLB-Series is a compact, single pole, push-to-reset family of thermal circuit breakers designed to protect equipment. The CLB-Series features ratings from 3-40 amps with a variety of bushing and termination options. 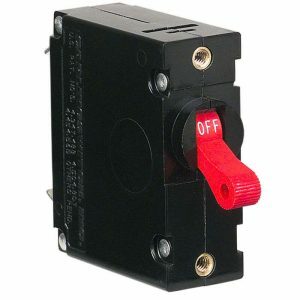 Share the post "CLB Thermal Circuit Breaker 3 Amps"
The popular CLB-Series miniature circuit breakers from Carling Technologies offer a reliable, cost effective solution for circuit protection requirements. The CLB-Series is available in a range of current ratings up to 40 Amps and is suitable for both AC and DC extra low voltage applications. The compact design, quick connection and simple mounting makes installation a breeze. 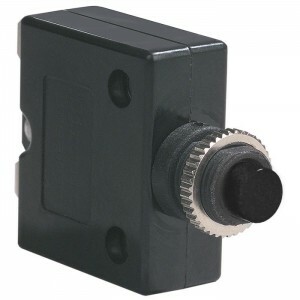 The standard model is supplied with a M12 mounting bush fitted with a knurled nut. An indicator plate which fits over the bushing is also available and is imprinted with the words ‘Circuit Breaker – Press To Reset’. 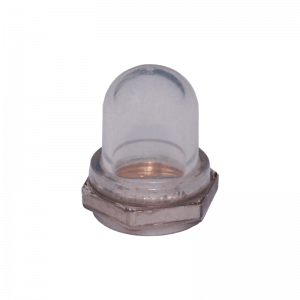 An optional clear silicon rubber waterproof boot is also readily available. Various hardware options, terminals, actuator colours and mounting styles are available upon request.